A Gridiron Goddess Administrative Note: WTF WORDPRESS? I’ve about had it up to HERE with wordpress’ lack of support. As you can see my banner image is still not showing up. IN FACT, I changed the entire look of this site and my dashboard reflects this, yet I come to the site and it’s the same old broken header b.s. of the past month or so. I hope to get it fixed this week. T Minus 3 months and counting until COLLGE FOOTBALL! THREE MONTHS FROM TODAY COLLEGE FOOTBALL KICKS OFF!!!!!!!! More specifically, Rey Maualuga and my USC Trojans meet the Wahoos of UVA in Charlotesville. 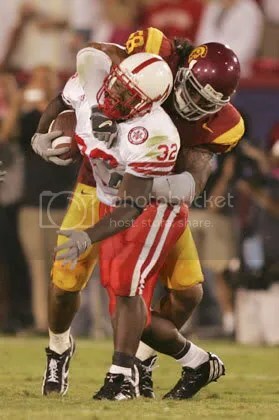 I predict USC wins by at least 2 touchdowns. Hello Football Fiends!!! I hope everyone has a wonderful Memorial Day Weekend!! I am going to take a short break from blogging. I am trying to finish writing my book proposal and need to focus and limit my distractions. Since we’re in the DOLDRUMS of football season anyway, this seems like a good time to take a break. If you’d like to guest post during my break, EMAIL ME!! Congratulations to USC Women’s Golf: 2008 NCAA Champions! 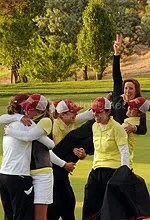 Congratulations to the Women’s Golf team at my beloved University of Southern California!!! The Women of Troy are the 2008 NCAA Women’s Golf Champions! Even better, they beat cross-town arch rival UCLA for the title! My high school Alma Mater Bishop Gorman just won the Nevada State High School Baseball Championship! It was a Las Vegas showdown when the Gorman Gaels battled the Green Valley High School Gators for the title. The baseball team joins BGHS’s football team in State Championships won this academic year. Now you all know how I got to be such a sports fan! 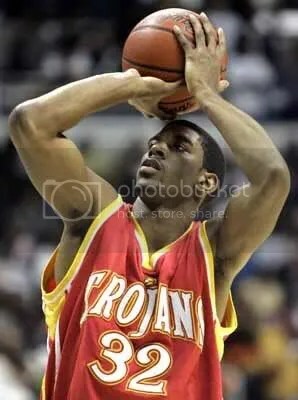 It started at BGHS, was nutured at USC and grew to an all out frenzy as the years wore on any my alma maters continued to dominate Nevada, the Pac-10, the NCAA. Ah, it is good to be a Gael and a Trojan these days! You are currently browsing the Gridiron Goddess blog archives for May, 2008.